It’s 1922 in New York City and young Millie Dillmount has just arrived in search of a new, modern life for herself. 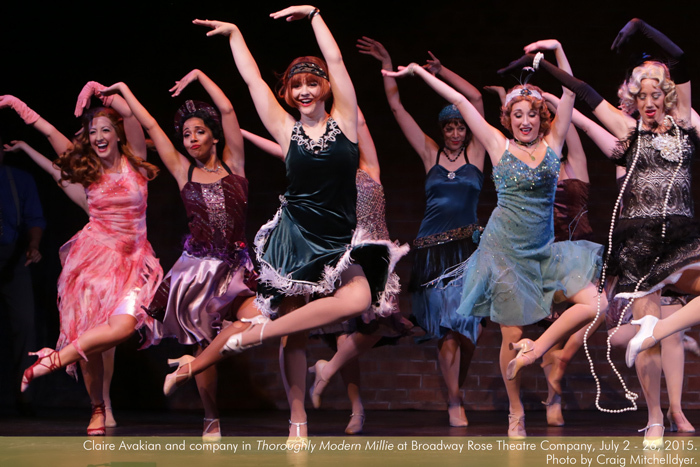 Overflowing with madcap adventure, heartwarming romance, and frisky flapper fashion, this Tony Award-winning musical combines the energy and optimism of the roaring twenties with invigorating dance numbers and charming new songs. Joe Theissen (Trevor Graydon III) has been a presence in the Portland arts community for over 20 years as an actor, singer, director and educator. Known primarily for his work in musical theater, Joe began his career in music, performing as a soloist with the Trinity Consort and OCP recordings. Since then, he has appeared in countless stage productions, earning a spot as a mainstay in the local musical theater community. Recent credits include: La Cage Aux Folles (Lakewood Theatre Company/Pixie Dust Productions), The Music Man (Broadway Rose), Disney’s Beauty & The Beast and The Wizard of Oz (Pixie Dust Productions), and [title of show] (triangle productions!). Joe is the recipient of multiple Drammy, PAMTA, and OTAS Awards for performing as well as directing. Joe currently teaches theater arts and music at Lake Oswego Junior High School. He holds a Bachelor of Arts in Music Theory & Composition (Linfield College), and a Masters in Teaching (Concordia University). 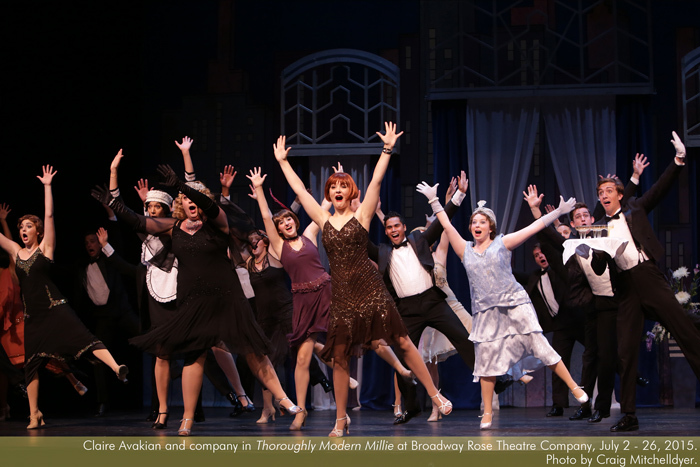 Emily Sahler (Mrs. Meers) is thrilled to be at Broadway Rose again, having previously played Doatsey May in last summer’s The Best Little Whorehouse in Texas, Barbara in The Bikinis (PAMTA, Best Ensemble), and Mrs. Tottendale in The Drowsy Chaperone (Drammy, Best Production.) Favorite roles include Connie in Jack Goes Boating, Sister Lidwina in Gracie and the Atom and Bette in The Marriage of Bette and Boo (Artists Repertory Theatre); Rose in Gypsy!, Jack’s Mother in Into the Woods, and Doreen in Tartuffe (Lakewood Theatre); the Caterpillar in Alice & Wonderland, a Rock Opera and Ms. Frizzle in The Magic School Bus Live! The Climate Challenge (Oregon Children’s Theatre); Dr. Charlotte in Falsettos (Live On Stage), Ninon de l’Enclos in Child of Pleasure (CoHo), Prudie Cupp in Pump Boys & Dinettes (triangle productions! ), Marie Dindon in La Cage Aux Folles (Musical Theatre Co.), Sheila in Hair and Bonnie in Anything Goes (Portland Civic Theatre). Television credits: Portlandia and Leverage. Lisamarie Harrison (Miss Flannery) has worked with such companies as Broadway Rose, Lakewood Theatre, triangle productions!, Stumptown Stages, Theatre Vertigo, Milagro, defunkt, Live On Stage, and others. On-stage roles: Anne Gerety, Storefront Revue; Mother, The Sexual Neuroses of our Parents; Violet, 9 to 5 The Musical (Drammy nomination); Jody, The Bikinis (Drammy nomination, PAMTA award); Betty, The Great American Trailer Park Musical; Rhetta, Pump Boys & Dinettes; Sue Ellen, Honky Tonk Angels (PAMTA award); LaVerne Andrews, Sisters of Swing; Sister Hubert, Nunsense; Laura, Recognition; Mazeppa, Gypsy; Gabrielle, The Dinner Party; Elizabeth, El Grito del Bronx; Alcandre, The Illusion; Kate, The Wild Party; Woman 1, Putting It Together; Mae, Reefer Madness! The Musical; Rizzo, Grease. 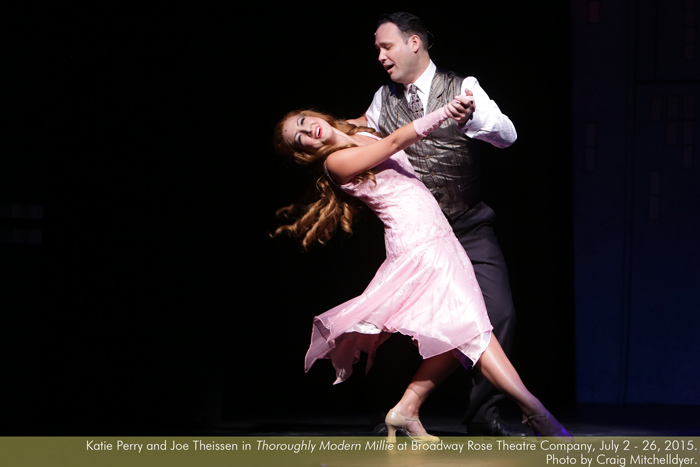 Katie Perry (Dorothy Brown) is thrilled to be playing Miss Dorothy with the Broadway Rose Theatre cast. She is a recent graduate of the B.F.A. Musical Theatre program at the University of Oklahoma, and is originally from Orange County, California where she attended Orange County High School of the Arts. Credits include: La Cage aux Folles (Anne), Carrie (Swing/Vocal Capt. ), Carousel (Ensemble, Julie u/s), Joseph and the Amazing Technicolor Dreamcoat (Narrator) and featured singer in Neil Bartram and Brian Hill’s The Theory of Relativity as well as Susan Egan: The Belle of Broadway at 54 Below. She has also worked as a featured singer for Six Flags Great America in Chicago. Katie plans to move to New York this fall. Annie Kaiser (Muzzy van Hossmere) appeared most recently as Mrs. Paroo in Broadway Rose’s production of The Music Man. Other Portland-area roles include: Martha Watson in White Christmas (OTAS Award) (Lakewood Theatre); Veronica in The Case of the Dead Flamingo Dancer, Mama Morton in Chicago, and Kaye in The Taffetas and A Taffeta Christmas (Drammy Award) (Broadway Rose); Miss Nelson/Viola Swamp in Miss Nelson is Missing (Oregon Children’s Theatre); and Isabel in Crossing Delancey (Magdelyn). Other favorite roles include: Nurse in Romeo and Juliet, Anita in West Side Story, Annie Sullivan in The Miracle Worker, and Mrs. Gibbs in Our Town. Annie has directed the children’s productions for the past four summers at Broadway Rose and coordinated the Triple Threat Teen Workshop series. Annie received her training at University of Washington and works as the Performing Arts Coordinator and ASB Advisor at West Linn High School. Samson Syharath (Bun Foo) Originally from Arkansas, Samson resides in Portland, OR. He has a bachelor’s degree in theater from the University of Arkansas Fort Smith and holds a certificate from Portland Actors Conservatory. Recent credits include Twelfth Night with Post5 Theatre, Young Frankenstein at Lakewood Theatre Company, Pimento/Pullman and Beaux Arts Club with Imago Theatre, Remme’s Run at Portland Playhouse (Fertile Ground Festival), Wilde Tales with Shaking the Tree Studios, The Fifth with Anon it Moves, and Dog Sees God, subUrbia, Rosencrantz and Guildenstern are Dead, and Hamlet with Portland Actors Ensemble; and A Bright Room Called Day at Portland Actors Conservatory. He is excited to perform with Broadway Rose for the first time! 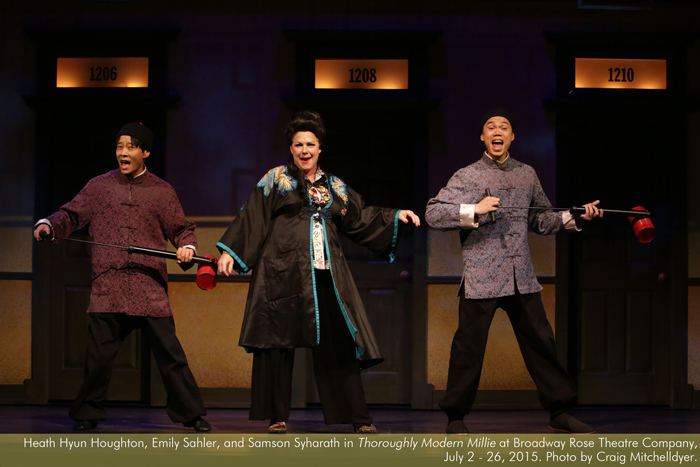 Heath Hyun Houghton (Ching Ho) was previously seen at Broadway Rose in Aladdin and the Magic Lamp and The Jungle Book. A founding company member with Anon It Moves (Hamlet) and Theatre Diaspora (The Dance and the Railroad, Breaking the Silence), he currently serves as artistic director for Well Arts Institute (Fixed, The Unexpected Guest, Fierce Love). Portland stage credits include appearances with Milagro (American Night, O Romeo), Imago Theater (The Black Lizard), Oregon Children’s Theater (The Stinky Cheese Man), Portland Shakespeare Project (The Tamer Tamed), and CoHo Productions (Enjoy, Maple and Vine). The current Broadway Rose production has everything it needs – great sets (really, very cleverly designed backdrops) that allow for speedy scene changes to keep the show moving, an amazing 12-piece orchestra under the always impressive direction of Alan D. Lytle, flawless and powerful vocal ensemble combined with Director Lyn Cramer’s delightful choreography and clever staging, and leads with the energy and joie de vivre to bring the audience to its feet at closing...Read more. Amid the candy-coated slave trading, Miss Flannery (Lisamarie Harrison) steals the show as the matronly lead stenographer at Millie’s new gig with the Sincere Trust Insurance Company…The brilliantly choreographed tap number with Flannery, a chorus of steno girls and their typewriters, is the best part of a relatively high-value production…Read more. The cast and crew at Broadway Rose are incredible, and I’m continually amazed at the quality of the musical theatre productions they put on. Claire Avakian is excellent as Millie. She can sing, she can dance, and she’s funny…Read more. 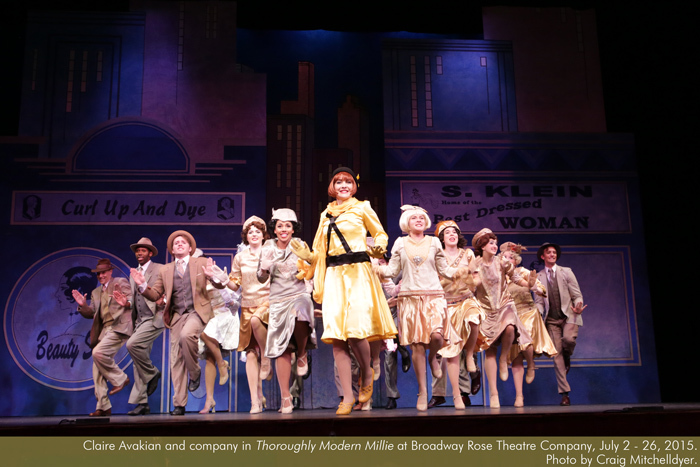 “Thoroughly Modern Millie” continues Broadway Rose’s long and strong tradition of providing quality musicals. There’s a 12-piece band!…Read more. 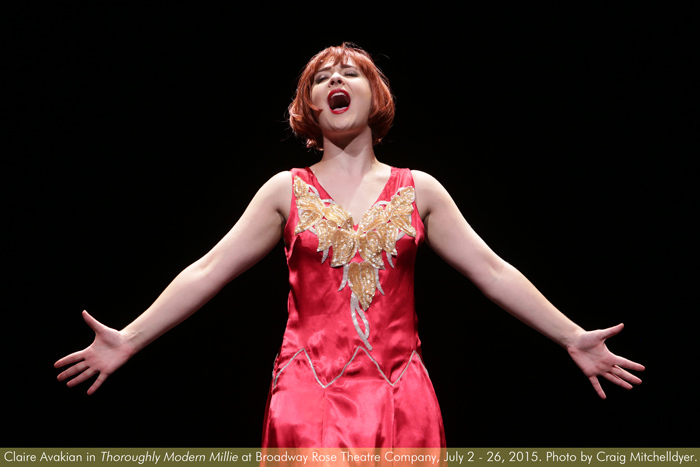 In the musical “Thoroughly Modern Millie,” young Millie Dillmount leaves her small-town life for New York City. 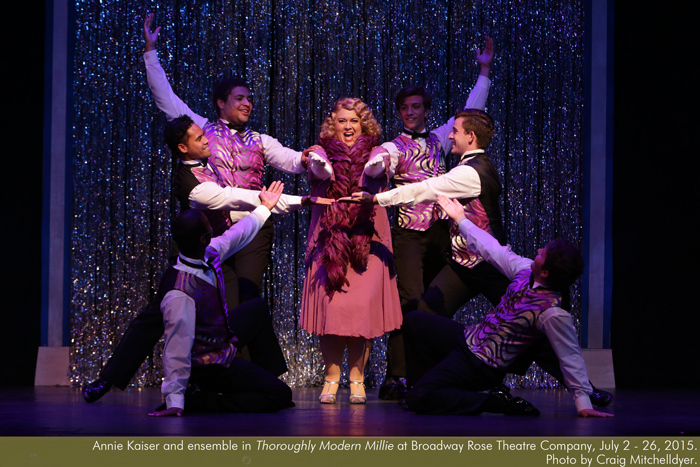 And much like the character she will play at Broadway Rose Theatre’s production, Claire Avakian, too, wants to follow her dream to the Big Apple…Read more. 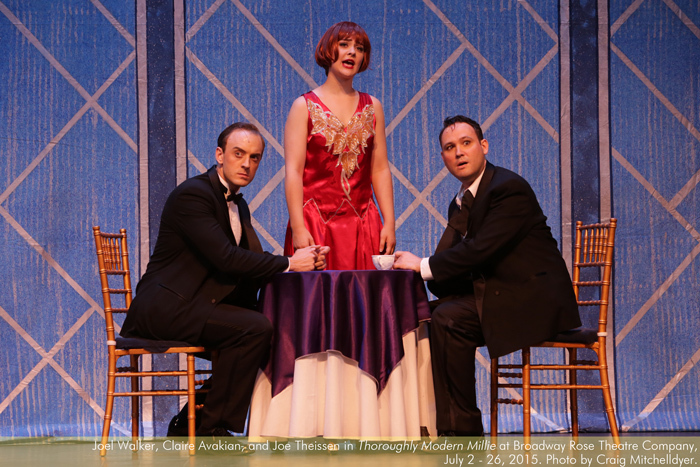 If Claire Avakian, who plays Millie Dillmount in the Broadway Rose Theater Company’s upcoming production of “Thoroughly Modern Millie,” seems even perkier and more effervescent on stage than the role calls for, it could be chalked up to all the stars aligning for Avakian this summer…Read more. 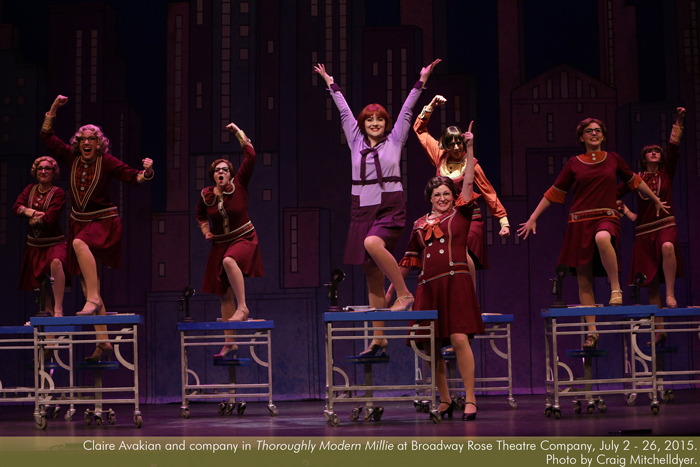 The winner of six TONY Awards including Best Musical, Thoroughly Modern Millie was the 2002 season’s most awarded new show on Broadway. 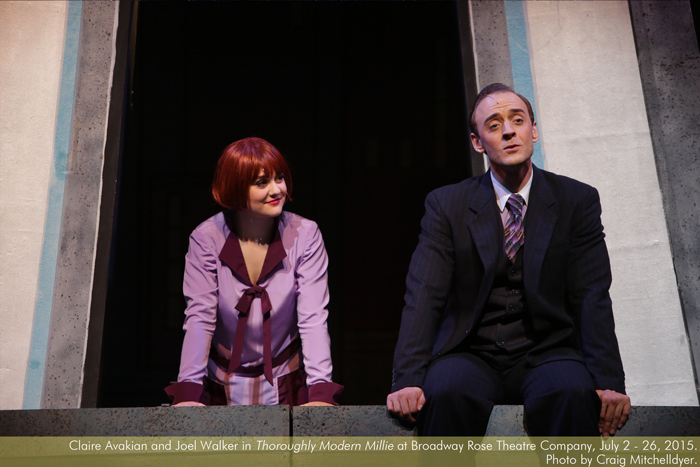 Based on the 1967 Academy Award-winning film, Thoroughly Modern Millie takes you back to the height of the Jazz Age in New York City, when “moderns” – including a flapper named Millie Dillmount – were bobbing their hair, raising their hemlines, entering the workforce, and rewriting the rules of love...Read more.